The Federal Energy Regulatory Commission (FERC) has extended a deadline for public comments on an environmental review of part of the planned Trans-Pecos Pipeline. 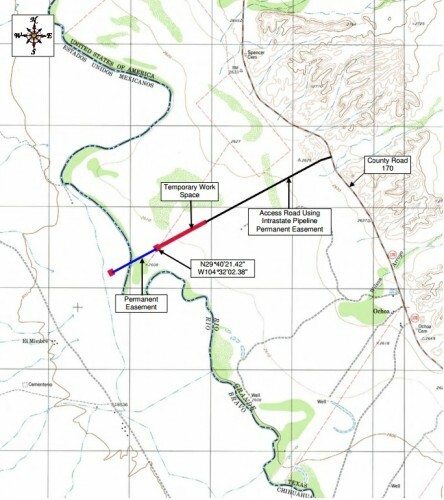 The commission is studying the possible environmental impacts of the pipeline’s border crossing section – the part where it would cross underneath the Rio Grande and connect with another natural gas pipeline coming from the Mexican side. The original deadline of August 24 has been extended to September 4. FERC says the extension is happening because some people on a mailing list about the project didn’t receive timely copies of a notice that the environmental study was getting started. The opposition group Big Bend Conservation Alliance is hoping the extra time will lead to more people getting involved in the process. The group is holding a series of comment-writing workshops in the Big Bend area. Opponents and two local counties have called for stricter federal oversight on the project. Meanwhile, the pipeline company’s V.P. of Engineering Rick Smith says land surveys for the pipeline’s potential route are almost finished. “We have 136 miles permission to survey, out of the 143 [miles of the proposed route], we’ve completed 130 miles,” he says. The environmental review will help regulators decide whether or not to issue a border permit the project needs to bring natural gas from the Permian Basin to power plants in Mexico. This entry was posted in KRTS News and tagged big bend, Big Bend Conservation Alliance, Energy, FERC, Industry, Infrastructure, Natural Gas, Trans Pecos Pipeline. Bookmark the permalink.